Size: 5.9" x 3.2" x 1.1"
The Palmtronic F-61 is another calculator manufactured by Canon missing a calculator chip from Texas Instruments. The brain of the F-61 is a NEC uPD955C chip, obviously an enhanced version of the uPD951C found in the F-51. Running Mike Sebastian's "Calculator forensics" gives an unacceptable bad result of 9.2079408 instead the expected value close to 9.0000. 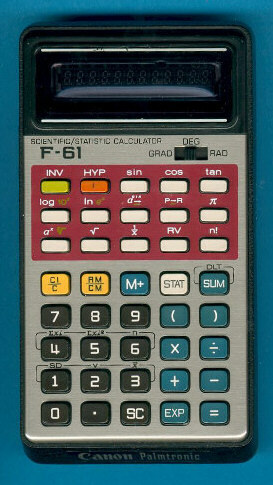 This places the F-61 in the league of boring calculators like the Canon F-6 (12.199423) and Rockwell 61R (10.4328). The other calculators in the early scientific line are the F-31, F-41, F-51 and the F-71. Within one year Canon introduced much sleeker calculators with LC-Displays, don't miss the F-52 and F-62 sibblings.